Bruce Castle is situated in Brix village, rue du Castel. 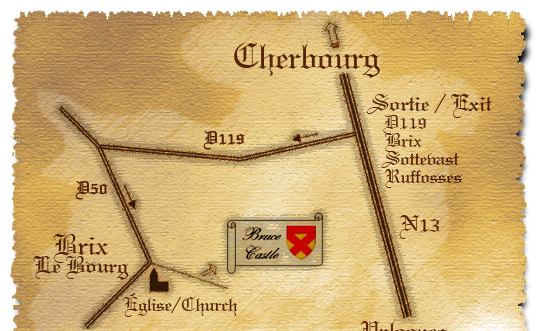 Coming from RN 13, about 9 miles south of Cherbourg, take the exit “D119, Brix, Sottevast, Ruffosses” towards Brix. When you reach the village, turn left just before the church. Bruce Castle is at 30 meters on your left. We are open all year long on reservation.